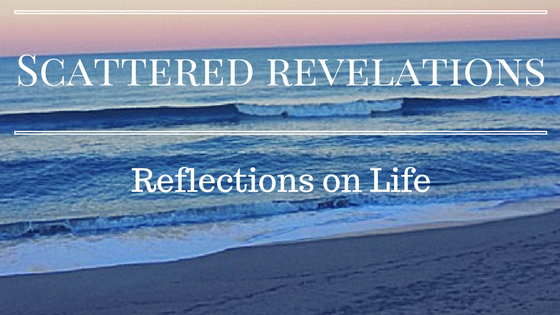 I preached this sermon on Sunday August 10, 2014 at the Unitarian Universalist Congregation of the Outer Banks. To many people the word signifies the acceptance of something that puts a strain on the intelligence. Accordingly, faith is to them a belief is what is not true or in what is by nature not fact but wish. To others the word faith signifies the acceptance of some belief simply because a church, a tradition, a state, a party, demands it. They may recall that St. Ignatius of Loyola once said, "We should always be disposed to believe that which appears white to us is really black, if the hierarchy of the Church so decides." With some justification, then, they hold that faith is a belief in "some nice tenets," a "dear deceit" (as archaic as those phrases suggest), which relieves one of the responsibility of thinking for oneself; it is therefore a positively dangerous thing, a form of bigotry that will brook no questioning or criticism and that dresses itself up as "the cure for modern pride" and as "humble obedience to the will of God." But conventionally "religious" people have no monopoly on credulity. Those who reject the inherited "faith" are sometimes only the victims of a new credulity. Nothing could be more credulous than the belief that faith dies when traditional belief dies. Our world is full to bursting with faiths, each contending for allegiance. Hitler claimed to teach again the meaning of faith, Mussolini shouted to his disciples "Believe, follow and act." "Fascism," he said "before being a party is a religion. "Those who were called to put down the battalions of the brown shirts and the black shirts were asked to show the faith that lies behind freedom. So the procession of the gods passes over the state of our world. Human history is not the struggle between religion and irreligion; it is veritably a battle of faiths; a battle of the gods who claim human allegiance. So I have to say that writing this sermon did not get off to an auspicious start yesterday. I had trouble sleeping on Friday night waking up worried, not able to go back to sleep. I did get some rest but woke up feeling not fully rested. I had this vision of myself getting up early, getting over here to my office and having this sermon knocked out and ready to go by late afternoon. Instead the lack of sleep left me emotional and stressed and the first half of the day was spent struggling with doubt - doubt in myself, doubting that things would ever get easier or better, doubt. As a person who lives and works with faith at the center of her life, doubt while necessary and valuable, can be anxiety producing and get in the way of work. I also started worrying that talking about faith and the necessity of faith in our lives would alienate those among us who are strongly atheist. That my talk of faith would mean that I would be advocating that all of us have to believe in God and by that I mean God as understood as a supernatural all powerful being who brought the world into being and answers our pleas if we are good enough and will reward or punish us for our lives after we are dead. Another way to say it is that I would be advocating for faith in an all powerful, all seeing, all knowing, unchanging God. Could I successfully talk about faith and doubt in a way that can encompass a wide range of understandings of beliefs? So bear with me and I ask your generosity. If the language doesn't quite fit, I ask you to translate and if I really get it wrong, come see me and let’s talk about it. I am a person who has faith in God. Now what exactly does that mean? Well I do not believe in an all powerful being who is all seeing, all knowing, all powerful, who has supernatural powers to disrupt the laws of nature and the universe and reach down and intervene in the affairs of individuals or even the world. When I say I have faith in God I mean that I trust that there is a spirit, a source of energy and life and creation, of love that is beyond me. It encompasses and transcends me and our physical world but is yet bound up unalterably in it. I believe it is a love that will not let me go. It is creative and sustaining. This God who I put my faith in hears my prayers and maybe that is all God does. “Prayer,” to use the words from the Jewish Prayer Book, “might not bring water to parched fields, nor mend a broken bridge, nor rebuild a ruined city. But prayer can water an arid soul, mend a broken heart, rebuild a weakened will.” Prayer in other words changes me so I can have strength and will to do my part in changing the world. It is the faith found in the words of Julian of Norwich "All will be well, all manner of thing shall be well" and as someone reminded me the other day its correlation "If it is not all well, than it is not the end." It is the faith found in Peter Mayer’s song “Everything is Holy Now”. That is the faith that sustains me but I know that that faith does not sustain everyone. I want to extend an invitation to all of you during these next months to share with me and with each other what sustains you, what keeps you going, what is of ultimate worth to you so much so that doubting it is felt at the core of who you are. Yesterday my lack of sleep coupled with worry and a heavy dose of doubt. Mostly doubt in myself which I struggle with in my life. It is one of my growing edges. Am I good enough? Am I doing enough? I am thinking that I am not the only one who struggles with this. After all most of the positive affirmation messages out there reminds us that we are enough, that we can lean in, that we need to trust that we need to take that leap of faith. We just need to believe enough to leap. We need to have faith that we are enough. I think most of us at some time or another wrestle with this kind of doubt. For some it can be paralyzing at least for a time. Even when we have wrestled with, worked our way through, for some of us given the right set of conditions – like some stress and lack of sleep – it rears its ugly head. So while doubt is necessary and can even be empowering, it can also be paralyzing. For me doubting in myself, can lead to doubt about my own faith … the faith that says ‘all will be well’ … another way to express it is that I start to lose hope. Rachel Held Evans, one of my favorite bloggers and authors, wrote about doubt on her blog recently. She said "I don’t always tell you about the mornings I wake up and feel the absence of God as though it were a presence—thick and certain, remembered all over again the way you remember in the morning that someone you love has died.” I have felt that kind of doubt; that kind of wondering if God really does hear my prayers and if God even cares. One of the great things about the saints and mystics of the Catholic Church is how many of them spoke about doubt, about the dark night of the soul, about the absence of God. Parker Palmer spoke about it in his books. Overwhelming doubt, the loss or shattering in what I have put my faith can be devastating. Doubt is also essential. As Adams points out in our reading, not all faith is helpful and some is even harmful. Doubt can strengthen our faith. We can come out the other side. Our faith and our very selves changed. Another writer James Hollis tells us that doubt can lead to revelation. Hollis writes, "To bear the anxiety of doubt is to be led to openness; openness leads to revelation; revelation leads to discovery; discovery leads to enlargement." (Hollis, 220) When we embrace the anxiety of doubt, not run from it, not suppress it but embrace it then we can allow our faith to deepen, to transform. While at the time it felt devastating and like my entire world was falling apart when doubt in many of the essentials in my Catholic upbringing emerged, it led me to a deeper sense of faith. As I realized I could not remain with integrity a Roman Catholic, my faith deepened and was less about what I was raised to believe and more about who I am and what I believe. My faith at that moment stopped being something handed down to me, unexamined, accepted somewhat uncritically to a deeper examined faith. 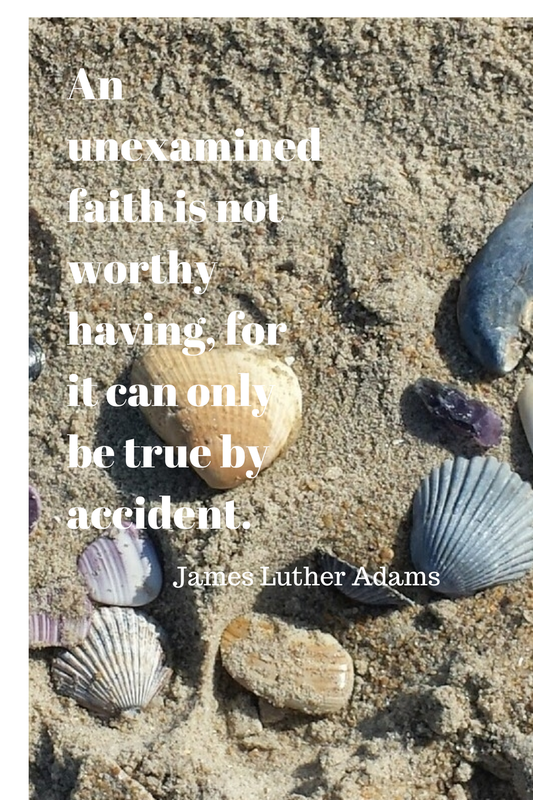 The kind of faith James Luther Adams tells us is the only one worth having. Throughout my adult life, I have continued to examine faith, my own faith, our UU faith, being curious about the faith of others. Maybe for some of you there is a similar story; a story of no longer being able to hold on to the faith of your childhood. Maybe for you, your faith was shattered as illness or disability left you unable to do things you loved to do or that you assumed you would one day be able to do leaving you wondering you who are if you can no longer do these things. Maybe it came as children grew up and left home and no longer needed you to be their parent in that day to day way and you had to find a new way to be a parent, to fill your days. Maybe it came as jobs were lost or careers changed, leaving you with a sense of lost identity. Maybe it was the loss of a loved one whose absence left the world a lonely place. Living an authentic full life will mean that we will change, our faith will be shattered and we will have to begin again. Not everyone can handle or make the journey; for some the shattering of their faith is something they cannot recover from. Hopefully we do not make this journey alone but have trusted companions, spiritual practices, a faith community because others have traveled this journey before us and we don’t have to do it alone. I hope this community serves as a place to recover from doubt, from what might seem the ripping apart of our lives and our faith … a place for re-imagining and re-building that which grounds us and is most sacred to us. Faith in something bigger than ourselves, call that God or to quote Adams “that which ultimately connects humans “ or “that which we should put our confidence in” can ground our lives, give meaning. It can inspire us to use our lives to heal and not to harm. Unexamined faith, blindly accepted faith, faith that claims it is without doubt, can do great harm; can lead to judgment, to a disregard for those who do not share the person’s “faith.” It can lead to forcing oneself into an uncritical belief in someone or something. As Adams tells us in the reading, fascism was not just a party or political persuasion it was a religion - a system that demanded unexamined, uncritical faith. We know where this uncritical acceptance of faith led - it led to war, genocide, devastation to all of life. What is it for you that is bigger than yourself? What words would you use to describe it? Maybe another way to ask is where do you find the holy, the sacred. Do you find it in nature like some of the children did in our story? Do you find it looking in the mirror or in the faces of others? I know for me I see the face of God whenever I look into the eyes of my daughter, my spouse, all those I love. Do you experience mystery but are you unsure to call it God? Faith requires doubt – it requires us to doubt because when we get too certain about it, it ceases to be faith. Yet too much doubt and we are paralyzed, unable to take a stand, unable to act. As Unitarian Universalists we embrace doubt. We say “come, come, whoever you are”. Come even though you don’t have it all figured out. Yet we as UU’s have seen the paralyzing power of doubt; the endless debates and word crafting– writing beautiful words but never taking action. Waiting for certainty, waiting to make sure everyone is on board. Yet that kind of waiting, doubting is paralyzing – it is not the kind of doubt that leads to deeper faith, to enlargement – it simply leads to more doubt waiting for certainty; an assurance that we are right and won’t fail. At some point we have to stop waiting, stop talking, and leap. Yes we may get it wrong but that too can strengthen us, change us, transform us.